Date: January 26, 2017; prior to the public unveiling of Marilyn’s portrait in the Ogilvie Exploration Room. KM: The history of science is an unusual and somewhat obscure field. Few people find their way to the history of science by a direct highway; rather, most travel through backroads and byways. What were your early academic interests? MBO: I was going to be an astronomer. When I was about 8 or 9, I was planning to go to the Moon or to Mars. I won’t tell you about the Egishdeemen who lived on Mars, but I told my little friends all about them. KM: When and where did you obtain your undergraduate degrees? MBO: I went to Baker University [in Baldwin, KS], for a Bachelors in Biology. Baker is a small liberal arts college. At that point, I realized, in what I regarded as a great discovery on my part, that all knowledge seems to connect together. Later, I earned a Masters in Zoology from KU. KM: What are some of the diverse life experiences that brought you to first consider the history of science as a profession? MBO: Chance is the biggest one. We had been in east Africa for 2 years. I was teaching biology and chemistry for TEA [Teachers for East Africa], in bush country outside Dar es Salaam, Tanganyika [formerly German East Africa, now Tanzania]. We were coming back to Norman because my husband Phil wanted to get his PhD in Zoology here. While we were in Africa, we heard of Duane Roller from someone who knew him at Columbia and found out that he had some sort of collection of old books at OU. So I wandered up, looked around, and eventually met him. I thought the old books in history of science were so wonderful, and decided to take a reading course. It was by Tom Smith on American science. One course led to another. When a seminar paper was raked over the coals, I wondered, Why am I doing this? But I was really hooked. I loved the old stuff. We held class right among the old books, and used them all the time. What was so great about being in this program is that we had it all, right at our fingertips. 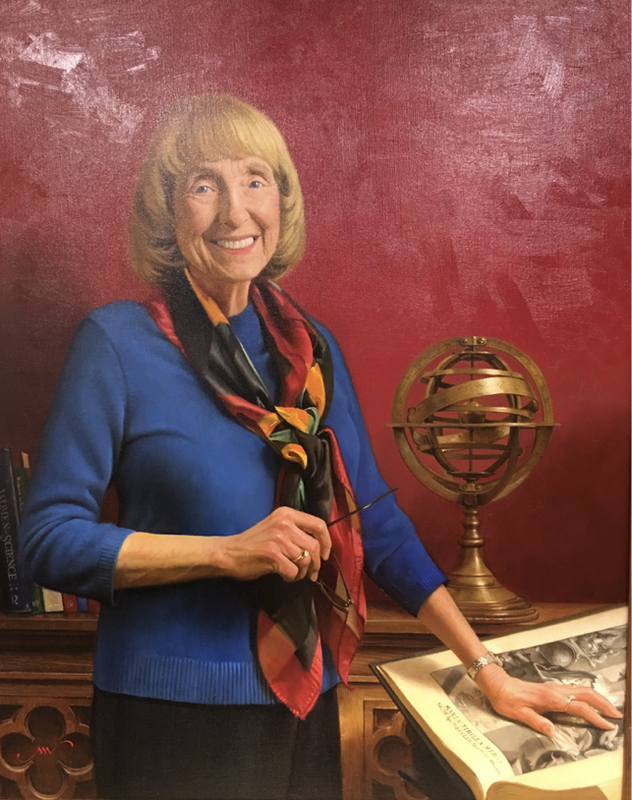 KM: Marilyn, you embody the spirit of the OU history of science program in many diverse roles, including student, teacher, mentor, scholar, professor and curator. Let’s start with your experience as a student. When did you begin your studies at OU, and what year did you graduate with your PhD in the History of Science? KM: Duane H.D. Roller was the first curator and professor of the History of Science at OU. What are your memories of Dr. Roller from your student days? MBO: We won’t talk about the cigarettes and ash trays. Perhaps I shouldn’t say that! He was the king. I was scared to death of him. He would go on trips to buy books, leaving his paperwork spread out on the big table in the reading room. He would put all his bills on that table, which we couldn’t help but notice as we held our seminars there. We shared the excitement as the books arrived. His classes were absolutely inspiring, and made me realize that history of science was what I wanted to do. KM: Who were some of the other professors at that time, and people involved in the program? MBO: There were just four professors back then. Tom Smith, history of technology. Tom was acting curator when Duane went on trips. David Kitts, history of geology. I wrote my first good paper for him. I still have it, with his encouraging comments. And Roy Page. Marcia Goodman was librarian, who would open the books as they arrived from Europe, with Duane’s letters telling about them. We graduate students divided ourselves according to seniority: the Golden Age, with Sister Suzanne Kelly, Jim Morris, Chuck St. Clair, Betty Ruth Estes and others. Then the Silver Age. I was in the Bronze Age. KM: What was it like to research in the History of Science Collections as a graduate student at that time? MBO: One had better be in there doing research! Roller checked to see if we were there, and how many hours we spent. We often stayed until almost midnight. Roller chose who had the key to the door. The chosen few were known as the Key Club. As long as the library was open, we needed to be there. The Collections were on the third floor at this time. The carrels were along each row, with the stacks in between, so we studied in the same room as the books. KM: You also served the history of science program as a member of the teaching faculty. You are a professor emerita in the Department of the History of Science. What attracted you to teaching? MBO: I’ve always loved teaching. I taught secondary biology in Phoenix after receiving my Masters, and then in Africa. Later, I taught at Portland State and at OBU before coming to OU. KM: You taught both undergraduate and graduate courses. What are some memorable moments from your teaching experience? MBO: It’s so gratifying to receive emails from students even after all these years. They give my Facebook name to their friends. They remember books we read, like [Rachel Carson’s] Silent Spring. KM: Mentoring involves long-term relationships with students that grow out of the teaching experience. You served on dozens of graduate student committees, including mine. How were teaching and mentoring meaningful to your work at OU? MBO: Caring for the books is just a part of the job. Relating to the students – and student employees – is just as important. It’s not teaching facts, but teaching how to relate to people, how to bring books and the public together. If you like people, and you like teaching, these are as much a part of being a curator as liking the books. It’s a whole package. KM: OU is distinctive in having both a History of Science special collection in OU Libraries and a separate academic Department of the History of Science. As a result, you were a faculty member in both OU Libraries and in the History of Science Department. This special relationship between the History of Science Collections and the History of Science Department created a synergy between the two. How did this special relationship work out in practice? MBO: Beautifully. You might say there was always a blending between teaching and books. That is what DeGolyer [the founding donor] expected, that the books were to be used, not merely decorative. We take care of them in order that they might be used. The reason we have the books is so we can read what’s inside the books, not to keep them on the shelf. Many are now online, but that’s not the only way we use them. It’s a historical feeling that you’re talking with people in the past to see where their ideas came from. To me that conversation is what is fascinating. It’s a conversation between many different people, both past and present. We care for the books to keep that conversation going. That’s why the faculty in the history of science department are such wonderful colleagues. KM: What does that special relationship mean for students, faculty and visiting researchers? MBO: One example is our Mellon Travel Fellowship Program. It’s symbiosis. It happened only because of both, working together as partners. People now come to use our books from all over the world, and our students gain a more cosmopolitan view. To study history of science it’s not just about the books alone, or about formal teaching relationships. We are a community of scholars. We develop an enlarged circle of friendships. It’s all about making a place where interesting conversations happen. KM: As a professional historian of science, you have given special attention to the history of women and science. How did you begin your research on this subject? MBO: Just by accident, as usual. I was teaching at Portland State, a survey class in the history of science. Two girls wanted to write on women and science. They could only find one woman, Marie Curie. I couldn’t think of any either. So I started to search. The historian of science Marie Boas Hall came to Norman. We met at a party, and I told her about my manuscript on women and science. She said, “Why don’t I come over and look at it? Maybe we can have breakfast tomorrow?” So sitting around my kitchen table, she set me up to publish it. MIT accepted it [Women in Science: Antiquity through the Nineteenth Century (MIT Press, 1987)]. Then I was hooked. Nobody was working on women in science then. I was asked to do a two-volume encyclopedia. I didn’t realize what I had gotten myself into, so I asked Joy Harvey to co-author it with me. Although it was an edited work, we ended up writing most of the articles ourselves [The Biographical Dictionary of Women in Science (Routledge, 2000)]. KM: How would you answer a group of students if they were to ask which 2 or 3 of your books they should read or consult first? MBO: To consult, start with the Biographical Dictionary. But I like my Boring book best [A Dame Full of Vim and Vigor: A Biography of Alice Middleton Boring, Biologist in China (Amsterdam, 1999)]. I will have a Boring book and a Nice book! And I’m really going to like my Nice book best when I get it finished [For the Birds: The Life and Work of American Ornithologist Margaret Morse Nice (forthcoming)]. It is really pronounced “Neece.” The most popular one is Marie Curie [Marie Curie: A Biography (Greenwood Press, 2004)]. KM: At the annual meeting of the History of Science Society in Atlanta this past November, a roundtable session was devoted to you in light of the significance of your work for promoting research on the history of women and science. As I recall, there were no empty seats in the room. How has the study of women and science changed since you began your work? MBO: Totally different. It could be expected, just as the history of science has changed. History of science has become a multicultural study now. Not just about European men and elite ideas. Its scope has expanded. We’re still discovering women involved in science. But studying women and science is no longer focused upon that, upon locating and getting facts about them, but rather about interpreting their work in context. “Women and science” is no longer a special field, but an inherent part of scientific culture and essential for capturing any intellectual milieu. KM: Do you have any advice or wisdom to offer someone starting out today? MBO: Get as broad a background as you possibly can, in as many fields as you possibly can. Don’t try to specialize too quickly. KM: When and how did you became the second curator? MBO: They did a search, and I got one of those things in the mail indicating that you have been recommended as a possible candidate. I filled it in and forgot about it. I was teaching at OBU, but I was in Europe when they were trying to get a hold of me. They tried to reach me at all my hotels, since we didn’t have cell phones. I came back to interview with both the Dean of the Libraries and the History of Science Department. I was thrilled to get the job, but I wasn’t sure what I was supposed to do. KM: What were some of the most important goals and objectives you envisioned for the History of Science Collections as curator? MBO: I wanted to make it open to the whole campus, not just an ivory tower only for elites or a restricted group of scholars. We want you to see the books and appreciate what we have here. We gave as many tours as we could. We tried to establish a connection with friends in Oklahoma City to increase our visibility. That’s how we established the OU Lynx. KM: How did your collecting strategy change? MBO: I collected in new areas, including women in science, medicine, alchemy, astrology, and popular science. But I still built on strengths. We didn’t try to specify in advance what we might buy. I never knew ahead of time what opportunity might arise. We acquired both primary and secondary sources, everything a scholar or student would need together in one place. Visiting scholars did not have time for inter-library loan, or to wait for books checked out to be returned. We didn’t want to lose books from obscure presses that went out of print after only a few months. KM: You’ve traveled widely, both before and after becoming Curator of the Collections. Is travel important for a curator, and what has it meant for you? MBO: In those days it was important to travel in order to find books. There was no internet. I’ve set foot on every continent, including Antarctica, although I didn’t buy any books there! In China, I did research on Alice Boring, an American geneticist who taught there. KM: What are some of the most memorable acquisitions you made as curator? MBO: Two books high on my want list were the Epitome of Ptolemy’s Almagest by Regiomontanus , and the natural history of Mexico by Hernandez, published by the Academy of the Lynx . We were able to acquire both. My favorite might be the book by Maria Merian [Erucarum ortus (1717), “The Caterpillar Garden”]. I wish I had written a book about her! KM: Did you acquire many books in unusual or particularly fortuitous ways? MBO: I loved going into little bookshops. At that time you would find books where people didn’t realize their value for the history of science, particularly in the vernacular or for popular science. KM: You received an outstanding teacher award here at OU, as voted by students. How did your teaching experience relate to your role as curator? Were these two roles in competition, or did one role mutually enhance the other? MBO: Since curatorship involves dealing with people, it requires the same attributes as being a teacher. I honestly do like people, and I’m so proud of the books that I want to show them off to people and help people come to understand them. So teaching is important to being a curator. I never stopped. KM: How did you manage the demands of professional life, and what advice would you offer for younger professionals in achieving a work-life balance? MBO: Love what you do. My professional and personal lives overlapped quite a bit. Not when my children were little; that’s different. And very difficult. But you have to do what you love. KM: You were curator of the History of Science Collections for the better part of two decades, from 1990 to 2009. How did the role of curator change during your tenure? MBO: I was more interested in research. It’s hard to balance scholarship with administration. I didn’t like meetings. But it didn’t seem like I was going to work each morning, because I enjoyed the work and the people I worked with so much. It was a privilege and a joy. I could choose what I thought was the most important thing at the time, and work on that, so it was meaningful. I could have kept busy every weekend giving talks, but I had to limit that. Outreach was extremely important to me. KM: What do you hope for, when you think about the History of Science Collections a hundred years from now? MBO: It’s hard to envision. Not like it is now. I don’t know. I would hope that it would still be a repository but not just a repository. It certainly will be a museum, but I want the books to be used and the context of them to be understood for their own culture and time. Our human-ness is important to see in them. I have the same feelings toward the books as toward museum artifacts. But more than just objects on display, we need understanding of what they meant then and what they mean now for us and at any future time. KM: It takes an exceptional person to combine the many roles you have played at this university. I feel very strongly that no monument could capture all that you have meant for OU, but this Exploration Room seems appropriate. Learning activities from every exhibit gallery are gathered together here, along with exhibit-related books for both kids and adults. Throughout your career, your students, colleagues and friends have described you as animated by a passion to bring the stories of science to everyone. The Exploration Room is devoted to active public engagement, both on and off campus, to learners of any age, young and old alike. How did you feel when you first heard about the Marilyn B. Ogilvie Exploration Room? MBO: We were having dinner with Dean Luce at the time. I was overwhelmed with gratitude. It’s exciting to think about how this room will be a place of learning for both young and old. It shows that the books are for everyone to enjoy. These books do become old friends, yet I will never cease to feel a thrill when I see them. Through this room, many more people will come to understand. The activities developed to use here will spread beyond to schools and homes, through the OU Academy of the Lynx. KM: The Exploration Room features a portrait painted by noted Oklahoma artist Mike Wimmer. When you look at the portrait, one can see your books on the shelf in the background. There are astronomical instruments, too. What would you want people to notice? MBO: He placed my hand on my favorite book by Maria Merian. When I think of her, I’m determined to preserve the literary culture of the past. But more than that, we attempt to understand these people who were admirable in striving to understand and to create their world. Looking back and understanding their efforts will help us to do the same in our world. We can’t do that very well without help from them. It’s never completed. KM (postscript): As for me, I like how Wimmer represents Marilyn’s smile. But no painter could ever capture the fierce bright sparkle of her eyes! Marilyn’s eyes are too bright and too lively to be believable unless you meet her in person. Thank you, Marilyn, for consenting to this interview, and for remaining the spirit of OU history of science! This entry was posted in History of Science, Libraries. Bookmark the permalink. Does your church have a library?